Our client, a leading mushroom grower, wanted to develop an agricultural field into a modern mushroom processing facility. However, the development would require extensive efforts to satisfy local and state officials concerned with potential impacts to the local headwater stream system, as that the proposed daily water withdrawal of approximately 65,000 gallons per day represents a large portion of the water balance. The project was a two folded effort. First, an adequate water supply source would need to be located on the property in order to meet the project’s needs. Second, the proposed water source would need to be fully evaluated to determine whether adverse impacts would result from the new withdrawal source. The Site is mapped within an area not typically known for high yielding water wells, so the placement of the test drill sites was critical in finding an adequate water source. Before selecting the test sites, a review of aerial photography, lidar imagery, field measurements of strike and dip, and soil test pits were conducted. 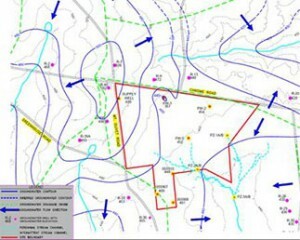 Rose diagrams and fracture trace analysis yielded five proposed test well sites on the property. After drilling just three test wells, more than enough water was produced by a single well. The hydrologic analysis included installing and monitoring three stream gauges for one year, survey of individual water supply wells within ½ mile of the project site, background water level monitoring in 15 wells, and completion of a 72 hour constant rate pumping test. Brickhouse coordinated with the PADEP, County Health Department, and local Municipality throughout the project. A final report was prepared and accepted by the PADEP and Municipality. The project remains in the planning stage.